Sharpest decline in price of new homes since 1970 spurs stronger than expected sales in April. NEW YORK (CNNMoney.com) -- A big drop in the price of the typical new home sold in April spurred much better-than-expected sales, according to the latest government reading on the battered real estate and home building market released Thursday. 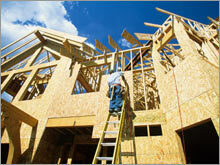 New homes sold at an annual pace of 981,000 in April, up 16.2 percent from the revised 844,000 pace in March. Economists surveyed by Briefing.com had forecast an 860,000 rate in April. The price of a typical new home sold in April was off more than 10 percent from a year earlier. The gain in sales compared to March is the biggest jump in 14 years. But even with the April spike factored in, April sales came in 10.6 percent below year-earlier levels. The median price of a new home sold in April plunged 10.9 percent from a year earlier to $229,100. The new price reading was also down 11.1 percent from the March reading. It was the sharpest year-over-year drop in median new home prices since December 1970 and the biggest month-to-month drop on record. Paul Kasriel, chief economist with Northern Trust in Chicago, equated the strong sales to the strategy of the Detroit automakers, who cut prices and offer other sales incentives to counteract weak demand for their cars and trucks, sometimes taking a loss on the sales. "The builders are clearing out the merchandise," he said. "They're doing a Detroit here. When you have excess supply, the quickest way to move supply back into balance with demand is to cut the price, and finally they're doing that. I would not say this is the bottom of the housing recession." Kasriel pointed out that the median number of months it takes builders to sell a completed home has risen every month for the past seven. It now stands at 6 months, the longest time it takes them to move a completed home since 1993, and it's almost double the 3.4 months it took them to sell a home as recently as September. However, the faster sales pace in April helped take the estimated months' supply of homes on the market down to 6.5 months from 8.1 months in the March report. The median price is the point at which half the homes sell for more, and half sell for less. The average price, which is generally higher than median prices due to the impact of high-priced homes, was also lower, although the drop was not quite as sharp. It fell 3.6 percent from year-ago levels, the biggest drop in six years. Economist Robert Brusca of FAO Economics said the much sharper decrease in median price than average price shows that the biggest declines are taking place in the less expensive part of the market. "That may have something to do with subprime problems," he said, referring to the problems with the mortgages written to buyers with less than top credit ratings. "Clearly, builders have been cutting prices and just as clearly, the strategy has been working." But unlike Kasriel, Brusca said he believes the spike in sales brought on by the price cuts is important, and it could be a sign that the battered housing sector could turn around sooner than later. "If we look at trends in average new home prices around the time of the last recession, we see that builder capitulation on prices was the catalyst for ending the weakness in the sector," he said. "The low prices jump start demand and get some inventory off homebuilder's hands giving the market a push." The weakness in pricing has been seen since last year. Many builders have been reporting that they were cutting prices. The prices being quoted in the Census Bureau report may actually be underestimating that price weakness, since three out of four builders responding to their trade group's survey report offering incentives such a covering closing costs and offering extras in the homes at no charge in order to maintain sales in the weak market. The downturn in new home sales and home building has hammered results at the nation's largest builders, which are reporting losses, lowered earnings guidance, coupled with rising cancellation rates from buyers and charges for walking away from options they have on some land. Thursday, luxury home builder Toll Brothers (Charts, Fortune 500) became the latest to report a sharp drop in earnings. It had already warned it expected to miss its earlier guidance on 2007 earnings. Pulte Homes (Charts, Fortune 500), the No. 4 U.S. homebuilder, posted a loss late last month. No. 2 homebuilder D.R. Horton (Charts, Fortune 500) reported a 37 percent drop in the number of new homes sold in the latest quarter, citing weakness in prices and saying the typical start to the spring home buying season hasn't begun. No. 3 Centex (Charts, Fortune 500) and New Jersey-based Hovnanian Enterprises (Charts, Fortune 500) both also reported losses in the most recent quarter. No. 5 builder KB Home (Charts, Fortune 500) returned to an operating profit in its most recent quarter after an earlier loss, but its CEO warned in April that he expects the housing slump to get worse.